I won a beautiful skein of Duck Duck Wool Spellbreaker in the Project: Stash Por Moi Knitalong recently and have been faving all sorts of accessories on Ravelry as I consider how I should use it. 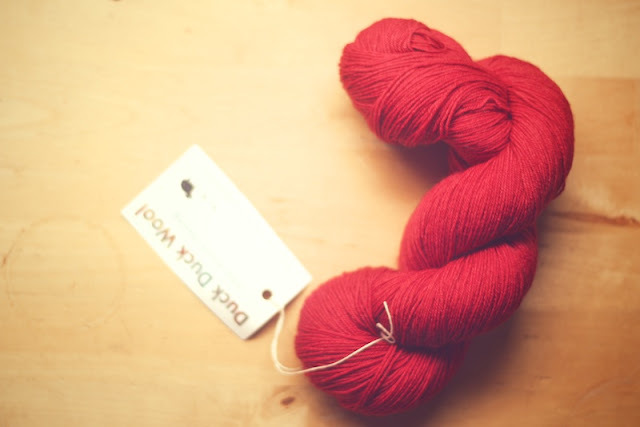 It's 464 yards of deep semi-solid red, a very rich shade. I have wanted to make Rose Tyler's Mitts for a while, but I'm not sure I should subject this beautiful yarn to the abuse I would give to a pair of mitts. I'm leaning toward either Aestlight , The Lonely Tree, Corvus or a Ysolda pattern- maybe Ishbel. This will be my first ever shawl, so any input will be much appreciated. Help me choose!! I've knitted two ishbels and I love both of them! Another option might be one that is more crescent shaped so you can wear it more like a scarf-- the first one that comes to mind is Charlize by Vanessa smith. I am so excited you are the knitter who will knit this skein--it was one of the very first colors I dyed that stole my heart! I think Ishbel or Lonely Tree would be amazing. 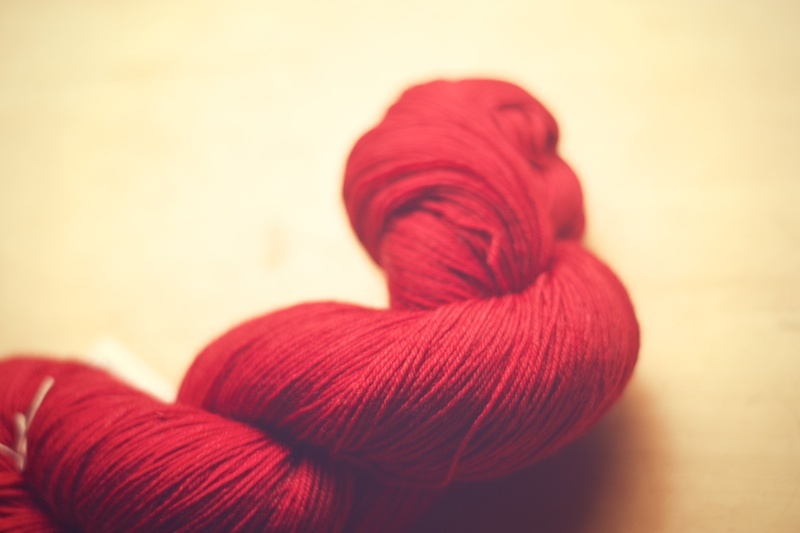 I also saw a beautiful and simple red Zilver worn by a knitter at a recent wool show and just adored it. Whatever you choose, I know it will be lovely! I was leaning more toward Lonely Tree and you're right it deserves drama! That's true, Caitlin. I planned on using the shawl more as a scarf, which I think Ishbel or Lonely Tree would also be good for. I checked out your FO page and you have so many great knits, beyond what Ive seen in the Holla Knits group. And congrats on your engagement! I thought that too, Monica! Great minds... But I really want to participate in the shawl KAL I mentioned, so I'm holding off on Strathcona. It would be beautiful, though and very wearable. I will make Rathtrevor Mitts because I have some stash thats perfect for it to get a Jane Richmond fix, though. Ha! See, Ive never heard of Zilver. I mostly ignored shawl patterns on Ravelry until anticipating this KAL and especially after hearing I'd won this skein. After a few weeks of sporadic project searching, I just can't get The Lonely Tree out of my mind. So I'm going with it! I'm excited to try something different and to watch your lovely yarn work up. My family oohed and ahhed a little when they saw the package in the mail. They're not into knitting, so that's saying something. Thanks, Sanda, it will be a pleasure to work with.